Saraí Monterroso’s oldest child did not grow up meeting adequate weight and height measurements. He never received assistance to help him recover and now she struggles so that her other two children do not suffer the same way. Two doctors in the Pop Wuj Nutrition Program help a woman weigh her child. Her first child suffered from malnutrition and, as he never attended any assistance centers, he grew up with delays in weight and height. 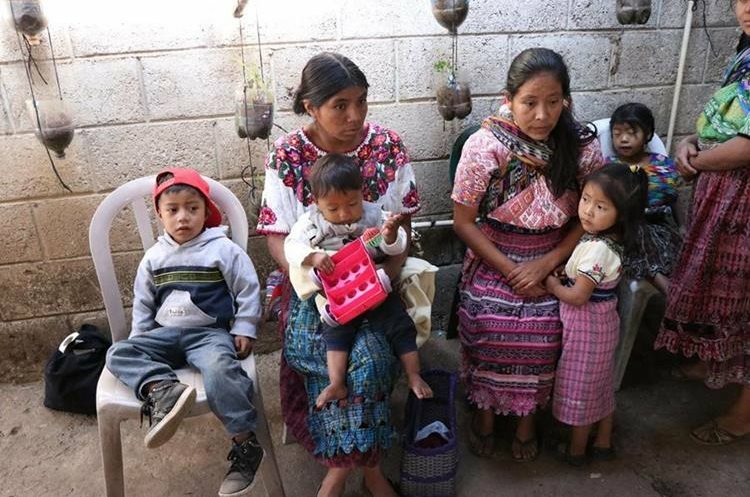 It’s different with the other two children because, although they also suffer from chronic malnutrition, they attend the Pop Wuj Nutrition Program, which provides support in three communities in the Department of Quetzaltenango. 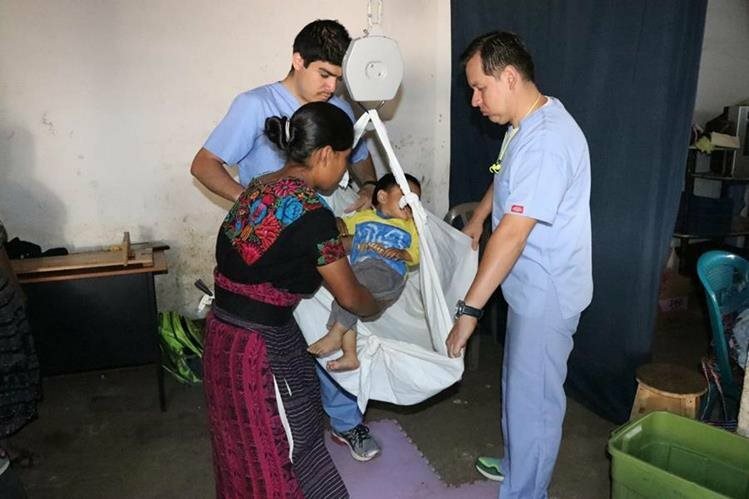 The group has worked for five years in the villages of La Victoria and Buena Vista, San Juan Ostuncalco, as well as in Llanos del Pinal, a village outside of the department seat of Quetzaltenango. Its objective: to change the futures of children with chronic malnutrition. To date, they have treated 550 children. The purpose is to identify children over 6 months of age with chronic malnutrition so that they can recover and by the age of three years, they will have better nutritional development. Since the beginning of the program, the association has traveled once a month to the communities with a medical team, nutritional supplements, toys, medicine, food, and the conviction to combat malnutrition. According to the Secretary of Food and Nutritional Security, based in Quetzaltenango, 718 cases of acute malnutrition were reported in 2015 and 616 reported in 2016. The Department of Health indicated that 46% of infants suffer from chronic malnutrition. In San Juan Ostuncalco alone, 50% of children suffer from chronic malnutrition. “I have three children, the oldest also had malnutrition but I didn’t know about the program, and because of his age he couldn’t recover. My younger children had an opportunity. I have seen how they have gained weight and how they are more dynamic,” said Saraí, 23-years-old, arriving to a meeting. The mothers tell their acquaintances about the program, so that others can come and participate. “My daughter is recovering. She had malnutrition but now she has gained weight and is growing. Before she got sick a lot,” recalls Amalia Fuentes, with the help of a mam translator, as she does not speak Spanish. 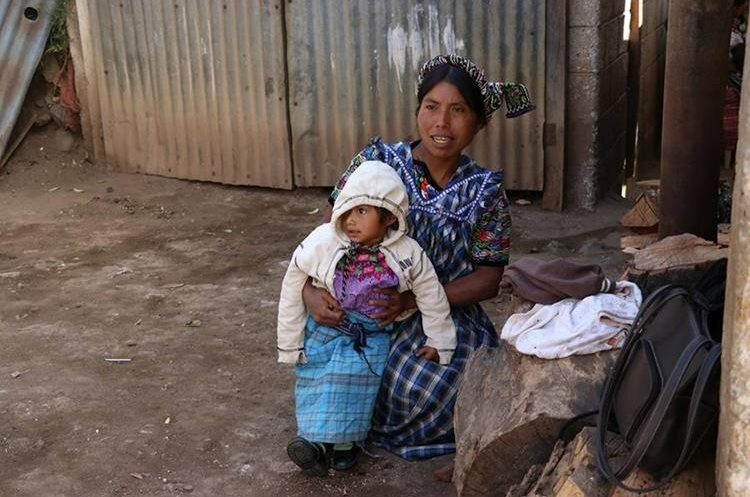 The Pop Wuj group was lacking a physical space to meet with the mothers, so community leaders lent them a space in a home in Llanos del Pinal, Quetzaltenango, where they meet once a month. They also have a daycare (NB the Family Support Center) to help support the mothers that attend the program. The association members are aware of the fact that chronic malnutrition perpetuates the cycle of poverty. Currently the program treats 110 children. When one recovers, their spot in the program is given to another baby. “Children that don’t recover are going to have 20% lower IQs. In the future they will not have good employment and the history of poverty will repeat itself,” affirms Carmen Alvarado, coordinator of the group’s social projects. The association monitors the children enrolled in the program to ensure their recovery, by making monthly visits to the communities in order to weigh and measure the infants, to whom they provide key nutritional supplements, like Incaparina, for adequate growth. Those in charge of the program estimate a success rate of between 90 and 98 percent. “The most rewarding thing has been the awakening of the families, who are used to their children not finishing their education, to always being sick, to being poor. Not everything will change quickly, but the children will have a different future,” says Carmen de Alvarado. The expenses for the children’s care are covered by Association Pop Wuj, Timmy Global Health, and Foundation Todos Juntos, who form a partnership with the goal of saving malnourished children. Carmen de Alvarado indicates that they need economic resources to purchase food supplements, as well as to pay for transportation, food, and the salaries of the medical professionals. The average cost of caring for one child for two months is US$25 – about Q183 – . Those that wish to collaborate can do it by volunteering or by donating Incaparina, toys, and clothes. You can contact the association through their Facebook page. Amalia Fuentes and her daughter, Candelaria, 2 years old, one of the children who has improved since entering the program. Chronic malnutrition affects the height and brain development of human beings due to a lack of necessary nutrients over a long period of time. It has long-term consequences in child development. Four out of every ten 5-year-olds in Quetzaltenango have this condition, and eight out of every ten are indigenous from a rural area. Chronic malnutrition causes less memory retention in school, lower productivity makes children more prone to falling ill, and lowers IQs. These children score between 10 to 15 points less in mental development tests in comparison to healthy children. The estimated recovery time for children is from six to 30 months, although it varies case by case. Parents play an important role, as they must change their food and drink habits and follow the doctors’ recommendations. 60% of the families that attend Association Pop Wuj Nutrition Program live in extreme poverty, subsisting on less than a dollar a day. The original Prensa Libre article, Asociación Ayuda a Niños a Superar la Desnutrición Crónica en Quetzaltenango was published on April 18, 2017. Download a scan of the original publication. Medical students and residents assist with medical consultations and dispense medications to patients. Profits from the Spanish School support the projects. They are successful businesspersons who have chosen to use the profits from their jobs to realize social projects. This week, over 100 people received free medical attention and medication. In another program, 150 children started school thanks to the scholarship program. The school also supports a daycare/afterschool program outside of Xela for the children of mothers who work outside of the home. The environmental projects include planting thousands of tree seedlings for reforestation as well as the construction of more efficient, safe stoves in rural homes. These accomplishments are the fruits of the labor of a collective from Xela who, through the creation of a Spanish school, have generated the funds necessary to finance these projects, said Roney Alvarado of the Association Pop Wuj. He added that 70% of the project expenses are covered by the school’s profits. The remaining 30% comes from donations to the projects. Medical students and residents come the from the U.S. to study Spanish, provide medical care, and receive cultural competency training in order to provide more humanistic care. Dr. Meg Sullivan, managing doctor, reported that the medical clinic is open Tuesday and Friday and health campaigns are held five times per year. Matt Parsons, a volunteer, stated that four weeks is the minimum time commitment. Estudiantes de Medicina y residentes apoyan con las consultas y entrega de medicamentos a los usuarios. Son empresarios exitosos que dejan en segundo plano el desarrollo económico individual y realizan obra social con las ganancias de su trabajo. Esta semana, más de cien personas recibieron atención médica y medicinas, todo gratis. En otro escenario, 150 niños podrán iniciar sus estudios gracias a una beca, y en la periferia de Xela existe una guardería para las madres que salen a trabajar. En el plano ambiental, este año miles de árboles nacerán y serán plantados, así como decenas de mujeres rurales cuentan con una estufa mejorada y consumen menos leña. Estas realidades son fruto del trabajo de un colectivo de quetzaltecos, quienes a través de la creación de la escuela de español Pop Wuj recaudan dinero para financiar la obra social, informó Roney Alvarado, de esa organización. El 70 por ciento del financiamiento es con fondos propios, el resto es de donaciones, agregó Alvarado. Existen convenios en los que estudiantes de Medicina y médicos residentes de Estados Unidos vienen a estudiar español con el compromiso de realizar un voluntariado, en donde los involucrados reciben un curso de pertinencia cultural, con el objetivo de hacer más humana la atención. Meg Sulivan, médico responsable, dijo que atienden los martes, y cinco veces al año realizan campañas de salud. Matt Parsons, voluntario, indicó que el tiempo de permanencia es de cuatro semanas, y como mínimo una de capacitación. The original article , "Quetzaltecos Trabajan Para Hacer Obra Social" was published in the Quetzalteco.